Intelligent systems collect information from various sources to support their decision-making. However, misleading information may lead to wrong decisions with significant losses. Therefore, it is crucial to develop mechanisms that will make such systems immune to misleading information. 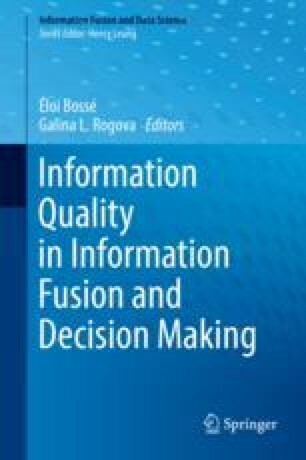 This chapter presents a framework to exploit reports from possibly unreliable sources to generate fused information, i.e., an estimate of the ground truth, and characterize the uncertainty of that estimate as a facet of the quality of the information. First, the basic mechanisms to estimate the reliability of the sources and appropriately fuse the information are reviewed when using personal observations of the decision-maker and known types of source behaviors. Then, we propose new mechanisms for the decision-maker to establish fused information and its quality when it does not have personal observations and knowledge about source behaviors. Research was sponsored by the US Army Research Laboratory and was accomplished under agreement numbers W911NF-14-1-0199. The views and conclusions contained in this document are those of the author(s) and should not be interpreted as representing the official policies, either expressed or implied, of the US Army Research Laboratory or the US government. The US government is authorized to reproduce and distribute reprints for government purposes notwithstanding any copyright notation hereon. Dr. Şensoy thanks the US Army Research Laboratory for its support under grant W911NF-14-1-0199 and The Scientific and Technological Research Council of Turkey (TUBITAK) for its support under grant 113E238.